Bushnell 786081ED Legend Ultra HD 20-60x80 ED Glass 45 Degree Spotting Scope 786081ED FREE SHIPPING! The Bushnell Legend Ultra HD 786081ED is a powerful spotting scope that allows clear, detailed observation at extreme distances, perfect for surveillance and hunting alike. Its two-speed focusing controls provide both rapid and precise magnification adjustments, so you can get the perfect view of your target. Fully multi-coated optics and ED Prime Extra Low Dispersion glass provide a clear, bright image even in low ambient lighting, and the reduced scattering also provides exceptional sharpness and contrast. The body is fully waterproof and the exterior lenses come with a hydrophobic Rainguard HD coating that breaks up water droplets, making it suitable for use in wet conditions. It comes with a tripod, scope glove and soft case for versatile use and reliable protection. 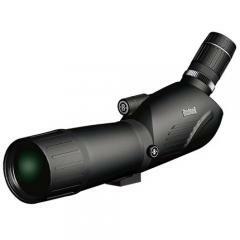 ©2002-2019 CopsPlus.com: Bushnell 786081ED Legend Ultra HD 20-60x80 ED Glass 45 Degree Spotting Scope 786081ED FREE SHIPPING!